Based upon more than thirty years experience growing rhododendrons in adverse climates, I have come to the realization that one factor alone has caused, by far, the majority of the problems associated with their culture. It is puzzling to find that this one basic problem, although of the utmost importance, has been rather neglected in the literature available to me. One reason for that neglect appears to be the dearth of research data available to enable us to adequately evaluate its effects upon the growth of rhododendrons. It seems necessary, therefore, for me to point out that the conclusions which I have reached are based upon my own gardens, and, as such, are most certainly a bit suspect. First, our family of plants has a drinking problem! I realize that most families tend to hush talk about such intimate details of family life because of the shame it might bring, but we must eventually face up to this fact anyway, so why not now? Water, and its relationship to my plants, has been the source of so many of my cultural problems when temperatures have fallen below, or have risen much above, normal that I believe more knowledge will prove interesting and beneficial to all who would grow these plants. Burned foliage, a result of adverse growing conditions. It seems hard to realize that total rainfall figures for an area can be so misleading. For instance, Seattle, Washington has approximately the same annual rainfall as Placerville, California. The total rainfall in Mount Shasta, California is about the same also, yet these three locations present a totally different picture in regard to the culture of plants. Seattle gets its rainfall as a slow drizzle throughout much or the year, Mount Shasta gets much of its rainfall in the form of snow, while Placerville receives its moisture in buckets! Seattle has rather consistently high humidity, moderate summer rainfall and a little snow. Mount Shasta has only an occasional thunderstorm in the summer, but very low humidity with much sunshine both winter and summer. Placerville has a period of about five months with no appreciable rainfall, moderately low humidity, and much heat and sunshine throughout the year. Water reaching the soil, whether from irrigation or from the sky, is disposed of in the following ways: water applied very rapidly to saturated soil will result in run-off; applied slowly, it will be withdrawn below the root zone of plants by gravity. Some water is evaporated from the surface of the soil; rapidly at first, then much more slowly after the topmost layer of the soil has become dry and dusty. Much of the remaining moisture held by the soil is used by plants and we should note that they use a great amount of it. The capacity of the soil to hold water is determined primarily by the size of the soil particles. Sand, having fewer particles of a fairly large size, holds much less water than clay, with its many, much smaller, particles. This water is held as a very thin layer surrounding each particle, and the thinner the layer becomes, the more tightly it is held by its particle. It is this water which is of the most concern to us, as plants will suffocate from lack of air in waterlogged soil but will wilt and die if they cannot extract sufficient water from the soil. Soil moisture is absorbed by the plant rootlets, especially in the area immediately behind their growing tips. The older portions of the rootlets, having developed a rather corky outer layer, do not absorb water as efficiently. As a result, plants having a great number of rapidly growing rootlets and a large root system will be able to absorb a greater amount of water under any given condition than a plant without such a root system - provided that the plants are the same species or variety! We should also note that the actively growing rootlets penetrate into new areas of damp soil, thus actually going to the water, while the older portions of the root system must attract the water to themselves. The water absorbed by the root hairs, or rootlets, is drawn up in the stem of the plant and into the leaves, where it exits via small holes called stomata into the air as vapor. This process is called transpiration and is of the utmost importance to us. We have both evaporation and transpiration of water to consider. This phenomenon is referred to as E.T. from its initials. Please don't confuse this one with the one from the movies, however! E.T. is well known to most famers in the arid regions of the western United States, for it is what they use to govern the amount and frequency of their irrigations. As the amount of water evaporated from a plot of bare ground is much less than the amount transpired by the same area when covered with plants, the transpiration part of E.T. is of more interest to us here. Let us look at some of the factors which influence the amount of water transpired by our rhododendrons. First, we should realize that the size of the plants' leaves is not as critical as the total leaf area exposed to the radiant energy. A mass of small leaves may transpire more water than fewer large ones. Transpiration requires a lot of energy, and this comes, as we might expect, from the sun. If all else is equal, transpiration amounts are directly proportional to the amount of radiant energy striking the leaf surface of a plant: the more energy, the greater the amount transpired. To accomplish this, a very effective pumping system has been developed by plants. How good this system is becomes evident when we realize that a large tree may transpire several tons of water into the atmosphere per day, and must lift that water up as much as 150 feet to the topmost leaves. To produce this flow of water from the soil into the atmosphere, a differential must exist in water pressure. When moisture is evaporated from the leaves as water vapor, the fluid pressure within the leaf is reduced. This causes a flow of water from the stem, with its higher pressure, into the leaf. 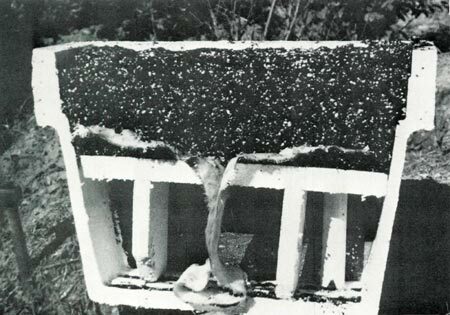 The resulting reduced pressure in the stem is transmitted on down to the rootlets, causing a "suction" which pulls some of the water away from the soil particles in the immediate vicinity. Various plants have differing abilities when it comes to extracting moisture, but a point can always be reached for any plant when it can no longer overcome the attraction of the soil particles to the water. Remember that we said that the thinner the moisture layer around each soil particle becomes, the tighter it is held. Even dust, which appears to have no water in it, does contain a measurable amount which is not available to our plants. One factor of paramount importance to rhododendron growers which effects transpiration is the relative humidity of the air surrounding the leaves. Dry air causes appreciably more transpiration than humid air, and the presence of wind increases this dramatically by replacing the layer of air next to the leaf surfaces before it can become saturated. Ambient air temperatures will also markedly increase transpiration as they rise, sometimes with disastrous results. Our family of rhododendrons has less ability to extract moisture from the soil than, say, manzanita (which can pull all of the available water from the soil down as far as six feet!). Many adaptations have been evolved by various plants in attempts to compensate for excessive transpiration demands. Under stress for water, many plants will have their leaves droop and curl in an apparent attempt to reduce the amount of leaf area exposed to radiation. Some plants, such as the grapevine, and certain grasses, will turn their leaves so as to present only the edge toward the sun, thus reducing the impact of excessive radiation. It would seem that the curling and drooping of rhododendron leaves in very cold weather may be a somewhat similar attempt, although there is some evidence to the contrary. I personally, do not believe that we have sufficient evidence as yet to settle this little controversy. It might be well to note at this point that for almost all plants there is a specific temperature of the soil in the root zone above which root growth ceases, as well as a lower temperature below which growth also ceases. This cessation of root growth must certainly have an adverse effect on the plant's ability to absorb moisture, even though there might be adequate moisture in the soil for most purposes. This leads to the finding that a given plant may not be able to replace water lost by transpiration under certain conditions quickly enough to prevent damage to the tissues, even though adequate water exists in the soil at the time. 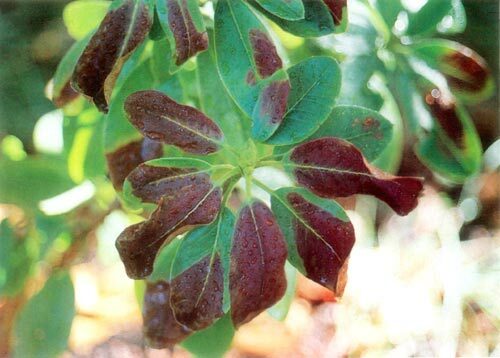 The leaves of such a rhododendron may suffer "burn" in rather localized areas where they receive higher levels of radiant energy, while the balance of the plant displays no untoward symptoms. It has been my experience that some leaves will burn when exposed to less than two hours of direct sunlight in late afternoon if only a slight breeze is present. This has occurred with annoying frequency to certain plants in my garden, while other plants in the same situation remain untouched. Whether this is due to genetic differences, or to differences in plant vigor, remains to be seen. A somewhat similar process occurs, although less frequently, when below freezing temperatures combine with bright sunlight, moderate wind and low humidities. It does seem to me, however, that the latter conditions effect the edges of the leaves more frequently than the central portions. Rather strangely, the first visible sign noticed in leaves which are being affected by rapid transpiration loss under conditions of very intense radiation and high temperature is a loss of chlorophyll in the central area. If the condition is severe, these same areas will later become tan, then dark brown and necrotic. At times some plants become entirely pale while others adjacent to them under the same conditions display no signs of trouble at all. As an example, a 'Cadis' A.E. planted in Mount Shasta under deciduous oaks presented an appearance of yellow-green throughout the plant by spring, but returned to a pleasing medium green by midsummer. Unfortunately for us, the family of rhododendrons has either never been forced to adapt to very low available moisture conditions, or has not adapted well to them. Their roots tend to be quite shallow. The foliage is lush, dense, and of a dark, absorptive color instead of being light and reflective of the radiation. They display their displeasure with your attempts to wean them from the conditions they most enjoy, by doing exactly what a great many other plants will do: they shorten their internodal growth, reduce the number and size of their new leaves, drop some of their older leaves, and just plain sulk! Ultimately, they languish into a pitiful state of scrawnyness and pallor which is not a pleasant sight in your garden. Typical withdrawal pains! Under identical conditions and in the same bed, identical clones will not necessarily all display the same symptoms. Where a few plants may show severe symptoms, others appear to be totally unaffected and thrive and generally appear to be doing very well, thank you! Could it be possible that some plants have developed a much better, more actively growing root system which can provide a more rapid replacement of the water lost by transpiration? This conclusion may be bolstered when we realize that all plants follow one essential rule in nature: all seek to maintain a balance between top growth, root structure and the conditions they find themselves in environmentally. If we reduce the amount of top growth of a plant, as in pruning, the plant generally produces more top growth soon afterwards. A reduction of root mass generally results in a temporary reduction of top growth until balance is restored. Similarly, any reduction in available water, or increase in transpiration demand for water, tends to reduce top growth in an apparent effort to balance needs and supply. Plants are considerably weakened during the period of adaptation to a change in their environment, and are then subject to damage from many things which normally do not cause them much trouble. Pine trees, for example, when weakened by drought, frequently succumb to attacks by pine beetles whose visits they normally can overcome. Similarly, rhododendrons that are transferred from gallon cans to our gardens, suffer a great deal from the drastic change in conditions. In the nursery they have become accustomed to fairly high humidity, much shelter, and a uniform media which has produced a lush, dense top growth. This relatively large top is accompanied by a rather small, compact root system, well adapted to the confines of the container and regularly supplied nutrients and moisture. In order to stay in business, the nurseryman must produce such plants as quickly as possible, and the better his plants look, the easier they are for him to sell. If these nice, lush plants fail to adapt quickly to conditions they encounter when planted out in the garden, the poor nurseryman gets blamed: he is penalized for doing a good job! As consumers, we should really know better than to expect a plant to adapt to such drastic changes very quickly, and should refrain from jumping to the conclusion that, because of our failure, such plants are not suitable for our area. Given a chance, many of those same plants might prove to be most successful. We have seen, then, that the following, related conditions may affect our plants rather noticeably when they are placed in new, or harsher, environments. 1) The relative size of the soil particles 2) The lack of adequate space for air in water-logged or compacted soils 3) The relative activity of new soil rootlets 4) The presence of very high, or very low, soil temperatures 5) The relative total size of the root system 6) The amount of water in the soil which is available to the plants. The above factors all are found below the ground level where we have difficulty seeing them. Let us now look above the ground at the more important factors. 1) The intensity of radiation 2) The total leaf area of the plant 3) The relative humidity 4) The ambient air temperature 5) The presence, or absence, of wind 6) The amount of leaf area actually exposed to radiation 7) The type of leaf structure 8) The ability of the plant to provide water to the leaves for transpiration, and 9) That all-important balance between the supply and demands of the plant for water and nutrients. And, now, to genetics. We must assume that in rhododendrons, as in other plants, a genetic variability exists in their ability to adapt to a change in their environment. It seems likely, also, that this ability may not be transmitted to all of the offspring of any given parent. This should not blind us, however, to the realization that a lot of other factors may very well interfere with this adaptation. Careful trials and selection over long periods are still necessary in order to be able to state that a give clone is, or is not, a "Good Doer." In my opinion, plants all too frequently have been classed as "heat tolerant" or "hardy to 5F" without due regard for many conditions which might change such a classification. Personally, I have yet to find any rhododendron which will not tolerate temperatures of 113F. To my mind, less talk of "hardiness" and "heat tolerance," and more about a plant's "adaptability" is in order. So what can we do to relieve this drinking problem in our plants? 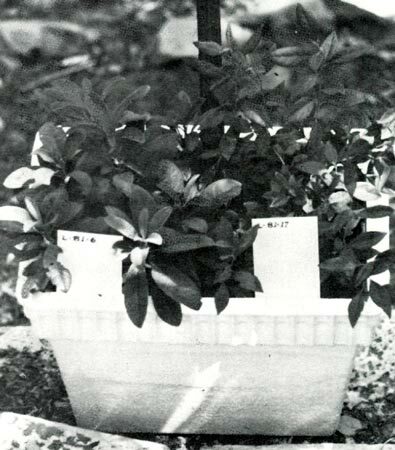 Until a real cure is found, we might well do the following: 1) See that the soil for rhododendrons is porous and moderately retentive of water, while remembering that for additives of vegetable matter at least 50% must be added to effectively increase the ability of soil to hold water 2) Ensure that sufficient water is available to permit normal growth of the plants 3) Provide rapid drainage for that water, using elevated beds if necessary 4) Encourage plants to have somewhat deeper root systems by watering a bit less frequently and allowing the topmost layers to dry out a little between watering, and 5) Avoid abrupt changes in water requirements by compensating for root loss, increased exposure, etc. For plants raised from seed, it is beneficial to obtain a large, deep root system as quickly as possible by using very deep media in combination with constant water from below. I have found Styrofoam boxes with false bottoms, fiberglass cloth wicks and a water reservoir to be ideal. (See accompanying photographs.) In addition, I find it much better to wait for the seedlings to become 2 or 3 inches high before attempting to transplant them for the first time. In my very hot climate, this reduces the mortality significantly. Cut away view of seedling propagation box. I also find it advantageous to use a mulch of " pea gravel on the pots whenever I place them outside where they will be exposed to both rain and sprinkler irrigation. This mulch effectively reduces compaction of the media, with beneficial results, especially noticeable with small plants. It should be mentioned here, that sprinkling water on the leaves when the sun is shining on them has never caused burning for me. Overhead watering, while increasing losses from evaporation when done during the heat of the day, increases humidity and cools the air for the plants. R. mucronulatum 'Cornell Pink', selfed. For transplanting from gallon cans into garden beds, we might do well to remember that rhododendrons like company. Crowding them a bit seems to be beneficial as they like the added protection given by close neighbors from radiation and wind, as well as the slight modification of air temperature and humidities. Gradual adaptation to the new conditions may be assisted by providing temporary shade for the newcomers, as well as by judicious pruning back of excessive top growth to reduce the transpiration demands for awhile. Plantings in very warm, dry climates appear to be much more successful when done in late fall or early winter, while spring seems to be preferred for cold climates. These planting times enable them to re-establish the balance between their root systems, top growth, and environment before the most stressful part of the season arrives. For those of you interested in extending the range of climatic areas where these delightful plants may be successfully grown, I heartily recommend regular contributions to the Research Endowment Fund of the ARS. Much, much more is needed to be known about the culture of these plants before we can be certain that we have improved their ability to adapt to the more rigorous conditions often found outside of the nursery. For those who are amateurs, like me, I urge trying many things that may be considered difficult or impossible. No two areas have exactly the same growing conditions, you know, and what works well for one person may not work for another. Above all, learn to talk with your plants, for they can tell you much more than you now believe. If all else fails, you just might take the advice given to me many years ago by my old friend, Halfdan Lem, who said, "Really, you should move closer to the coast." Dr. Letcher, an optometrist by profession, has grown rhododendrons under adverse conditions in the Mount Shasta and Placerville areas of California for more than 35 years.